My Uncle Ollie use to make this seafood pasta dish. It had a green sauce that looked like a pesto sauce but had fish in it or was fish-tasting. He was Sicilian, so maybe that will help. It was served over spaghetti and served with Parmesan cheese. Thanks so much. Hope you can find out what this was. I haven’t seen anything like it anywhere. Or tasted anything like it in years. Thanks for your note. This sounds like a very interesting dish, and I’m going to look into it. Sicilians make many different types of pesto. Some contain nuts such as almonds, pine nuts, or pistachios in addition to basil, parsley, or mint, but I’ve never tasted one that included fish. I’ve eaten puréed canned tuna or anchovy sauces for pasta in Sicily, but that doesn’t sound like what you’re describing. If you could elaborate on the flavor, that would help me a lot. What type of herb was used? Could the fish taste have been anchovies?. Anchovies are often used in a salsa verde, a green sauce with capers and parsley. Could you see pieces of fish in the sauce? Many Sicilian fish sauces contain mashed up sardines. What part of Sicily was your uncle from? Was the texture smooth, like a regular basil pesto, or was it more chunky? Was there any tomato? What color was the sauce? Cheese with fish pasta is not uncommon in Sicily, so I’m not surprised by this. If you can answer my questions, I’ll get on the case. This is just the type of pasta dish that I love most, so I’ll be happy to look into it for you. Thanks for the quick reply. It wasn’t a chunky sauce, and no tomatoes were in it. I’m not sure what kind of herb was in it, but it didn’t have a basil taste as far, as I can remember; it was a bit bitter and fishy. It was green in color; a dark green, as I remember, and not a bright green like a basil pesto would make it. It wasn’t a gritty sauce either, but rather a smooth one. I used to hate it when he made it back then, but I think I would like it now; that’s how strongly I remember the taste. I would definitely know it if I could taste it. Come to think of it, it could be anchovies, because it was a dark color rather than a light color. I don’t know about sardines. My uncle was from the northeast portion of Sicily, and I know in Sicily there are a lot of different influences because so many other cultures were introduced through wars. I could ask my cousins if they remember it, but I don’t ever recall them being around when he made it! I wish I could be of more help. The fact that Francesca couldn’t remember any ingredient except spaghetti in her “Lost Recipe” didn’t deter me; the style seemed familiar, and I could sense what I thought this pasta would taste like. I imagined it as a hybrid of a Sicilian pesto (which usually contains nuts, herbs, and sometimes tomato) and a salsa verde (which typically includes parsley, capers, anchovies, and lots of good olive oil). In Palermo several years ago I ordered a bucatini with clams that was cloaked in a green sauce made from parsley and mint (I can never resist a dish that includes pasta, some type of seafood, and herbs, and Sicily has them in abundance). It was delicious, but a little went a long way, since the addition of capers made it very pungent. But it was memorable. This culinary memory kicked in when I received Francesca’s inquiry. Francesca described her uncle’s pasta as fishy tasting but with no noticeable pieces of fish. Puréed fresh fish sauces for pasta are not common in Sicily (although pastas with small chunks of fish are), so I surmised it must have included anchovies, something often invisible but a great flavor booster, and since her uncle was from northeastern Sicily, maybe near Messina (but she doesn’t know exactly), a region very big on anchovy sauces, it all seemed to fall into place for me. 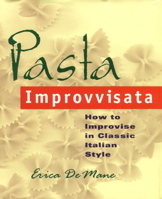 When I researched northeastern Sicilian pestos and fishy sauces for pasta, I couldn’t find anything that struck me immediately as the exact dish Francesca was talking about, but I did find a bunch of variations on salsa verde and a few that were simply purées of canned Sicilian tuna or anchovies with a little parsley and garlic thrown in. One recipe from La Cucina Siciliana di Gangivecchio, a book written by a mother and daughter who run a wonderful restaurant and inn in the northeastern town of Gangi, contains many of the flavors I was looking to combine, but it’s a slightly chunky, cooked sauce and doesn’t have the smooth texture Francesca describes. They call this pasta Gemelli con Erbe Aromatiche, and it contains anchovies, olive oil, parsley, celery leaves, sage, and rosemary, all gently sautéed and served with Parmigiano. 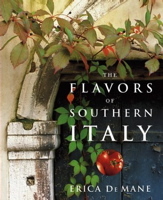 Now taking into consideration personal interpretations of local dishes, I though that various combinations of fresh herbs and anchovies could be delicious, and playing with these flavors could produce something that might jolt Francesca’s taste memory. The problem with dressing pasta with a straight salsa verde, as it is generally interpreted in Sicily, is that the abundance of capers in the sauce makes the dish too intense. So I began by replacing the capers with almonds, an ingredient often present in Sicilian pestos, to come up with a gentler taste and a richer texture. The bitter aspect Francesca remembers may have come from the herb mix (or from being a kid and finding green flavors unappealing, since she says she hated the sauce then but thinks she would love it now). Francesca doesn’t remember basil in the dish, so I first tried it with a mix of parsley and mint, a typical Sicilian herb combination. I wasn’t crazy about the result, primarily because our mint is so minty it gave the sauce a toothpaste flavor (mentuccia, the wild mint most used in Southern Italy, has a much more complex flavor). For my next try I used about three quarters parsley and one quarter basil, with a few celery leaves thrown in; this was delicious. The abundance of parsley steered the taste away from that of more familiar Ligurian pesto, and the slight celery flavor gave it the subtle bitterness I was looking for. For my first attempt I tried my much-loved salted Sicilian anchovies. I usually prefer these to the oil-packed varieties when making cooked dishes, but for an uncooked sauce I’ve come to realize that oil-packed often gives me a better flavor. So on my second attempt I used Flott, my favorite Sicilian brand of oil-packed anchovies, and they produced a much sweeter, more appealing result (less fishy, actually). I finally came up with a lovely, very Sicilian-tasting pesto, which I’ve now added to my repertoire of favorite pasta sauces. Whether it is similar to Francesca’s uncle’s sauce, I’ll have to wait for her to tell me. I understand that since Francesca didn’t really know what was in this pasta, I’m really only taking an educated crack at it, so if there’s anyone out there who recalls ever eating a dish like this, please feel free to send in your recipe. I’m sure Francesca would be happy to hear from you. And Francesca, please play around with this. If you think the version you remember contained, say, more anchovy, or less parsley, please fine-tune this to bring it closer to your memory. Note: Francesca remembers this pasta as being served with grated Parmigiano. I tried it with a Grana Padano and it was fine, and this is always an option, but I prefer to top mine with toasted breadcrumbs, a classic Southern Italian accompaniment to fish and vegetable pasta sauces (although grated cheese is not unheard of in Sicily for some fish pastas). In a small skillet, heat 2 tablespoons of olive oil over medium flame. Add the breadcrumbs, and season them with the sugar and salt. Sauté until they’re lightly golden and crisp, about 2 to 3 minutes. Transfer to a small bowl and set aside. 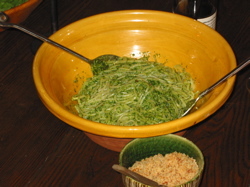 To make the pesto, place the garlic, almonds, and chili in the bowl of a food processor, and pulse until well ground. Add the parsley, basil, celery leaves, anchovies, and about 1/2 cup of olive oil. Pulse until you’ve got a smooth paste. Taste to see if it needs salt (it may not if you’re anchovies are very salty). The texture should be dense but not crumbly and dry, so add an extra drizzle of olive oil if you need to. Cook the spaghetti in a large pot of boiling salted water until al dente. Drain, saving about half the cooking water. Transfer the pasta to a large, serving bowl. Add the pesto, and give it a toss. Add a few tablespoons of the pasta cooking water, and toss again until you have a nice, creamy consistency, adding a little more if needed. Serve right away, either with the toasted breadcrumbs or with grated Parmigiano or Grana Padano cheese. I was wondering if you could help me with a recipe. Years ago, I had an employee who would bring me some sort of pasta dish, that I absolutely loved. The things I remember is that it was thinner than spaghetti, and it was more of a Pesto, than a sauce. It did have anchovies in it, plus it was a little spicy. 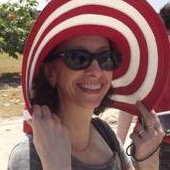 And it was red. I could probably figure it out… except for the red. Do I use dried tomatoes or tomato paste? I would experiment except my husband is allergic to anchovies… so I would be the only one eating the failures. Thanks so much! The dish you’re describing sounds to me a lot like something I was served on several occasions in Basilicata, a dish called bucatini di fuoco. This is a pasta dressed with a pesto made from roasted hot and sweet chilies, anchovies,and garlic. It’s quite spicy. Could be a version of that, but yours was served with a thinner pasta, probably capellini. I’ve never made this exact sauce at home, but the idea is to char the chilis over a flame, peel and seed them and then grind them together with anchovies and a little garlic. It’s also used at a condimento for fish. As far as I can remember, there was no tomato in the sauce, although certain versions may contain sundried tomatoes, which are very popular down there.